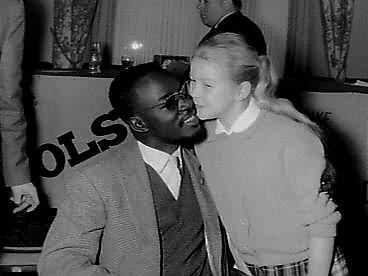 Jacques PERMAL wrote: Do you want to know more about BABA SY ? Thanks to PATRICK KOPP !!! 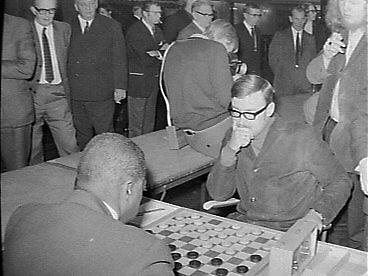 Harm Wiersma, during Brinta-tournament 1963. 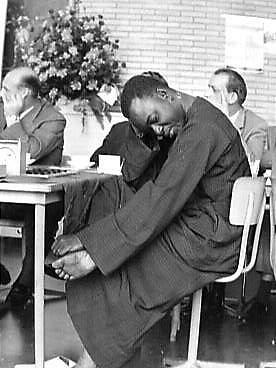 World Champion BABA SY from Senegal. 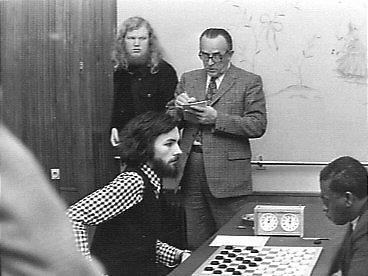 WIEGER WESSELINK-applets with games from BABA SY. 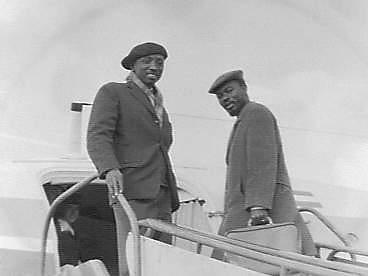 Baba Sy, 2nd Suiker, December 18th 1970. 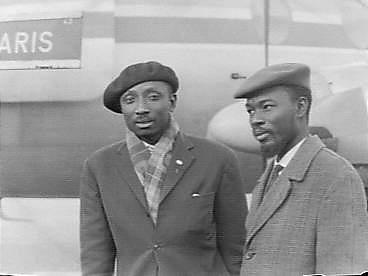 Baba Sy and fan, Int. 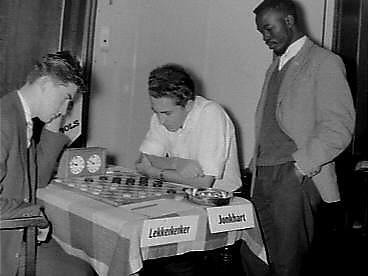 Lucas Bolstournament, Amsterdam, January 2nd 1962. 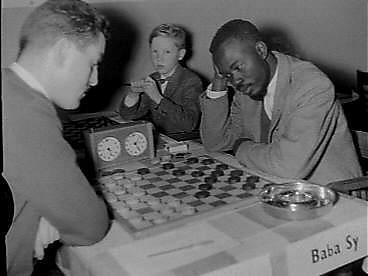 Gournier - Baba Sy, Lucas Bolstournament Amsterdam, January 1st 1962. Ton Sijbrands, 12 years old, is writing for Baba. 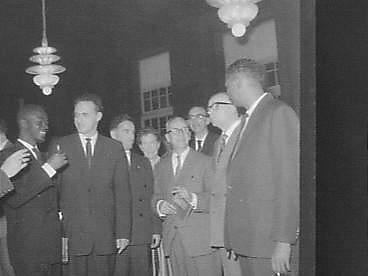 Baba Sy in Gieten, Drente, during WC 1960. 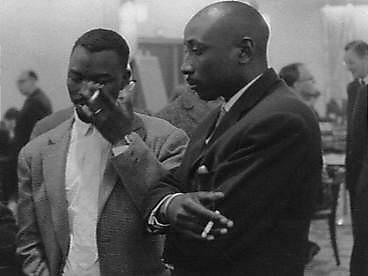 November 7th 1960. Last edited by Hanco Elenbaas on Wed Nov 23, 2005 03:33, edited 2 times in total. Thank you very much for these wonderful pictures. 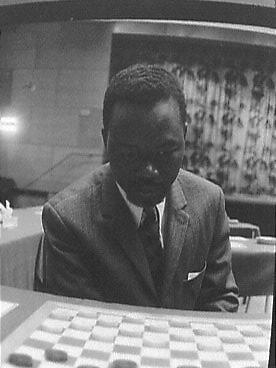 I run a 4000-page chess site on Black players and have featured GM N'Diaga Samb on occassion. 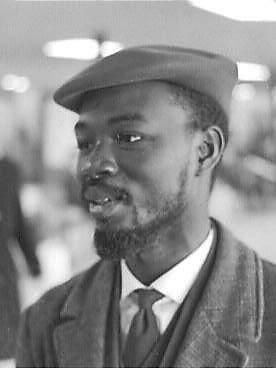 Looks like I'll do a page on Baba Sy now! 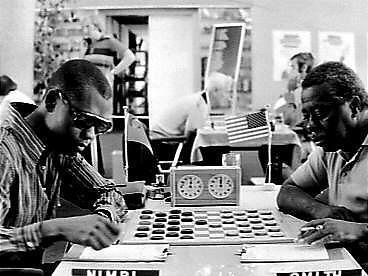 I had heard of Baba Sy from a chess master/ checker expert, Charles Covington. 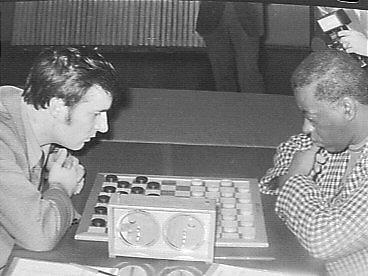 Of course there is a link between these two board sports and I find the combinations in checkers to be very, very beautiful and original. I'll share the site with him. Thank you! You're welcome and thank you for your kind words! I will bring you some other pictures from black draughtsplayers next week. I'm curious to see your site! 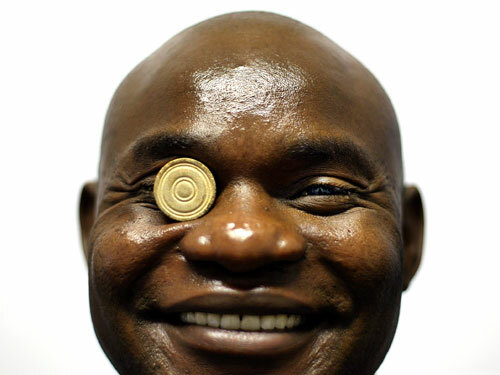 Ndiaga Samb says that the correct spelling of his name is Ndiaga Samb. 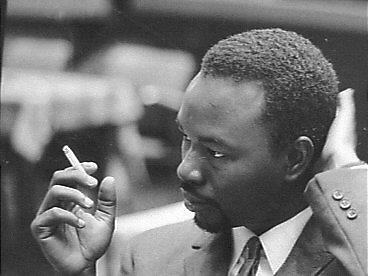 Lots of people are writing his name like you do, because they confuse his name with that from the N'Diayes, but Ndiaga of course prefers Ndiaga. Today is a historic day in The Netherlands! 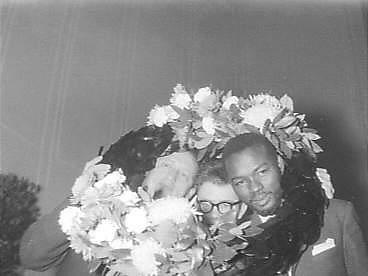 In Moscow an Afro-American became world champion all-round speed skating, the Dutch national folkloristic wintersport. The new world champions name is Shani Davis and the special thing is that for the first time since eightteenhundredsomething it wasn't a white man who became world champion. Shani Davis is from Chicago. Information : my first priority !! L'info en première ligne !! 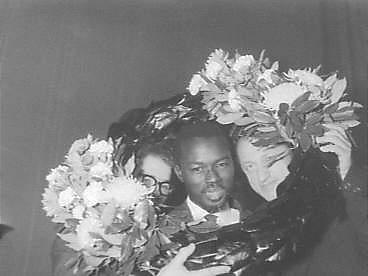 JEAN MARC NDJOFANG after his victory in CANNES 2003. Thanks for the correction. I've made the changes on the six pages where his name appears. How is Ndiaga Samb doing these days? 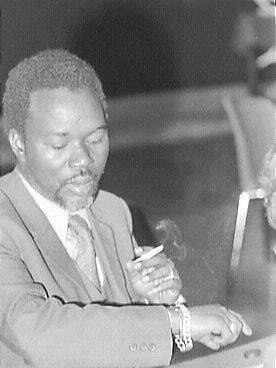 Is Baba Sy still living? If so, where does he reside? 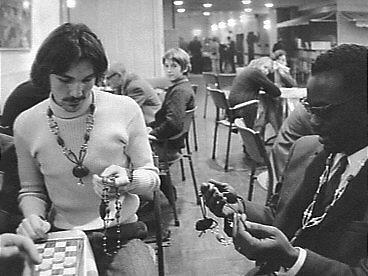 Tell GM Samb that he now has chess fans! I'm really intrigued at the world you all are in! 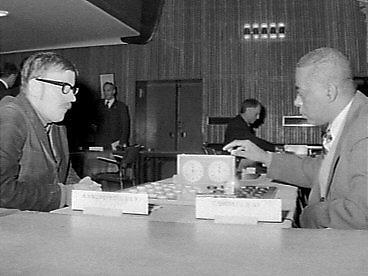 Is Ton Sijbands the draught equivalient to our Garry Kasparov? 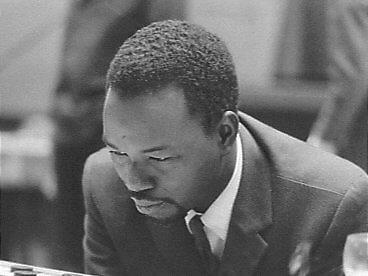 Players of African descent or Black players have not made the same type of progress in chess and only have one Grandmaster in Maurice Ashley. West Africa is strong is draughts, but very weak in chess. I believe the two phenomena are related. 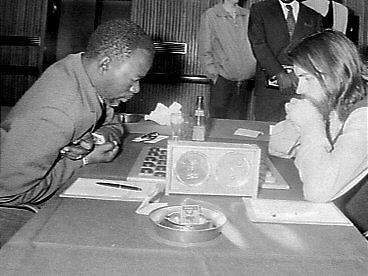 In West Africa, only Nigeria is strong in chess. I think you guys have a monopoly on board sports in that region. 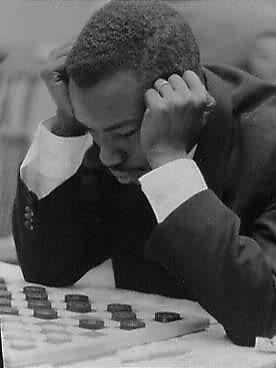 How many draught players compete in chess? 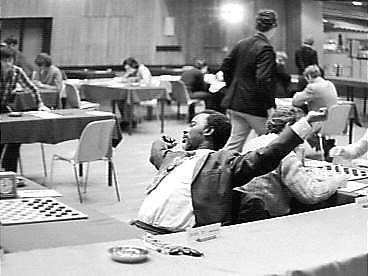 We have chess players who play competitive shogi and poker, but who are some noted draught players who play chess? 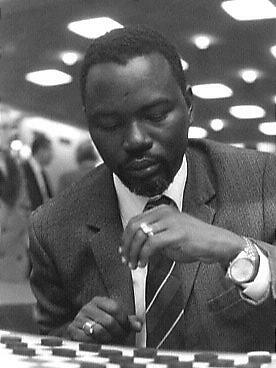 NDIAGA SAMB lives in the NETHERLANDS nowadays. He usually plays competitions (teams and individuals) in his "new" country. 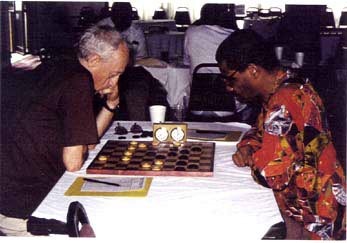 He won a lot of tournaments in the past. I will indicate the links where you will find more news later. 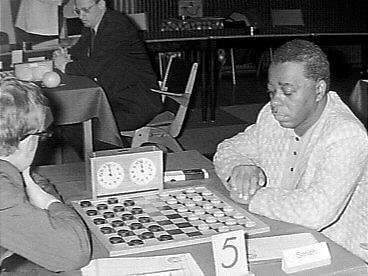 In 2003 in CANNES (South east of FRANCE) NDIAGA SAMB competed against a software. He lost. BABA SY died unfortunately. We will post more informations about his memory during the next week. Last edited by Jacques PERMAL on Sun Feb 06, 2005 23:26, edited 2 times in total. I wrote the following page years ago. I followed the Samb-Buggy match. It was the 2nd of such. 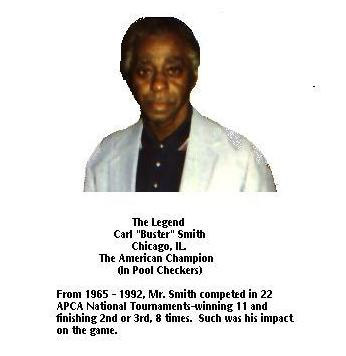 Have you ever heard of Carl "Buster" Smith? 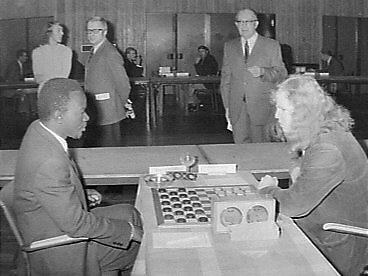 This American citizen was a legend in Holland during the seventys in which he played against the complete world top and hardly ever lost. Here are some more from Carl Smith, about whom the best draughtsplayers still speak with a lot of respect. Behind Andreiko is Ton Sijbrands. FLAUBERT NDONZI is camerounese player. 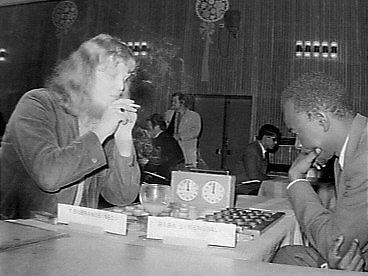 He played World Championship in the past. He is certainly the 2nd strong player of CAMEROUN after J.M NDJOFANG. He plays nows in PARIS. 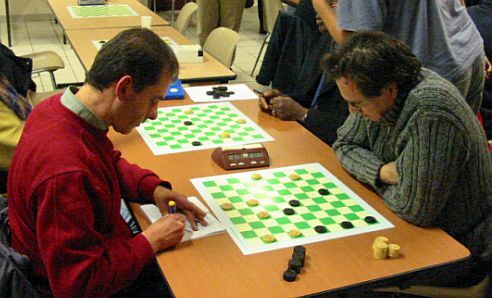 He won the ILE DE FRANCE LEAGUE CHAMPIONSHIP (PARIS AND SUBURB). He won the well-known ARNAUD CORDIER last day of this championship. I don't have photo of him. Perhaps HANCO could post one of him here ? 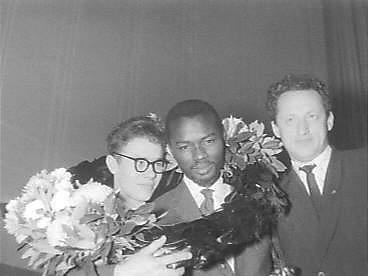 I'm not sure who is better, Léopold Kouogueu or Flaubert Ndonzi. They finished equal in Moscow 2001 and Kouogueu was before Ndonzi in the last African championship, wasn't he? "At last, the book with all the games of Baba Sy. 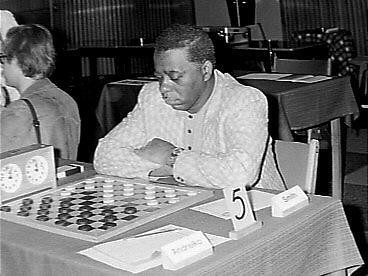 The first and greatest African player of his generation, whose great talent allowed him to become the equal of the best draughts players of the world. 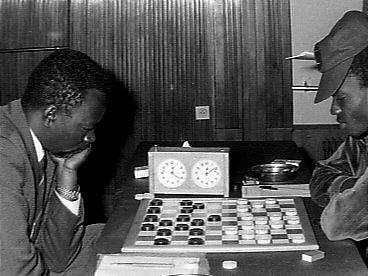 When I arrived in 1959 in Dakar, Baba Sy was already known as the unchallenged champion of draughts, with football and martial arts the national games of Senegal. He was young and strong. 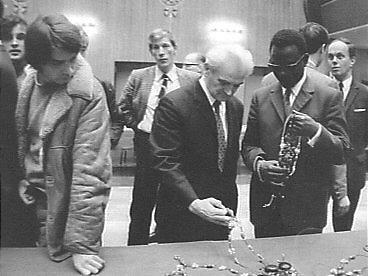 So he had to become well-known beyond his native Senegal. 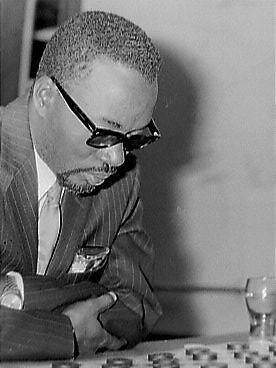 Thus I set out to have him present himself in the French national championship of 1959 in Chatellerault, for the first time in Europe. And so he did! 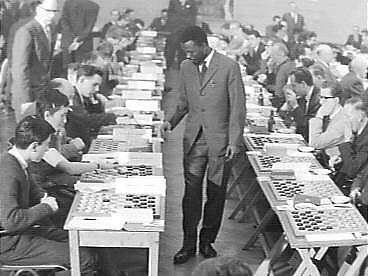 But his true colours as an exceptional talent Baba Sy showed in 1960, when he finished second in the World Championship, between the Russian grandmasters Chtchogoliev and Kuperman. It would be the start of a truly dazzling career. 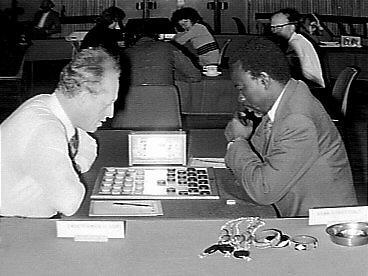 Beyond the great tournaments Baba Sy had become a true specialist in simultaneous games. 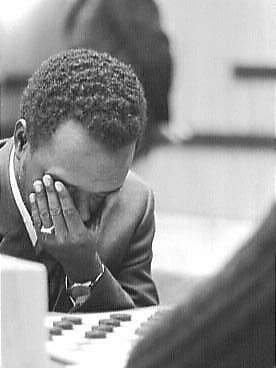 In this discipline too he showed all aspects of his great art: quick victories, astonishing combinations against an -at that time- unsurpassed amount of opponents. 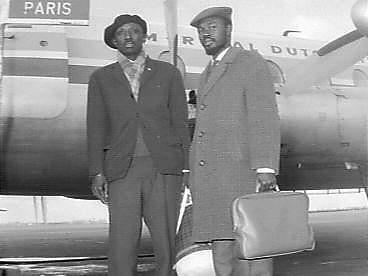 Baba Sy was loved for his modesty and gentleness, just as he never forgot who helped him to realise the dream of his life. His tragic end was a blow for us all. 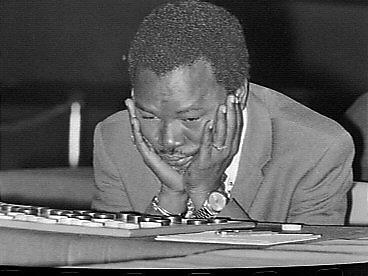 We are grateful that grandmaster Ton Sijbrands has succeeded in this remembrance of the fantastic talent of Baba Sy, not only for our own joy, but also for that of generations to come." So far Emile Biscons, national French master. 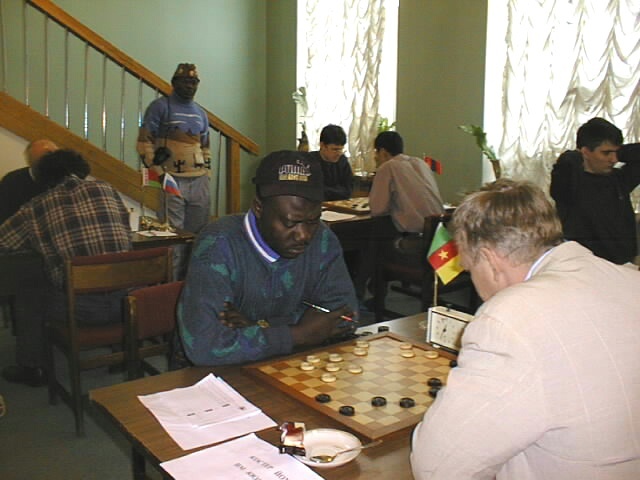 I, myself wrote at that time: "Thamks to the untiring pioneer work from Benedictus Springer, ex-World Champion, our country could get a first glimpse of the phenomenon of Baba Sy in the Hartevelt tournament. 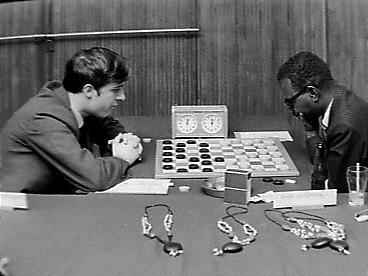 A year before this 'discover' by the Frenchman Biscons, working in Senegal, has astounded the world by winning the French championship as an outsider in one stroke. 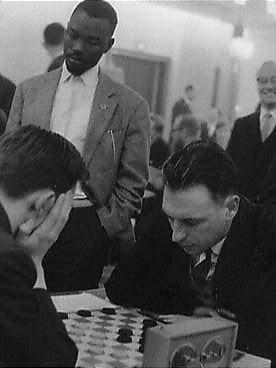 His comet-like ascent since 1958 climaxed in the Challenge Mondial, which he won in 1962, giving him the right to challenge the reigning world champion, Iser Kuperman for a match on the world title. However, this match did never happen to hitherto undisclosed reasons. 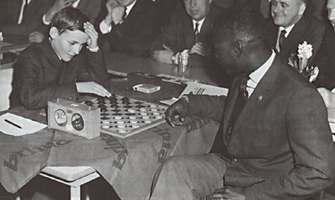 When Baba Sy died in an automobile accident in Dakar in 1978, he left the draughts world a legendary reputation and a wealth of games. 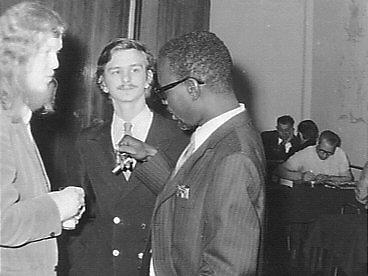 In the past, too much valuable material has been lost for posterity, but in the case of Baba Sy we have to thank Biscons and Ton Sijbrands for their efforts to preserve of this wealth. Without any doubt, Sijbrands has set an important and stimulating example for the draughts world. 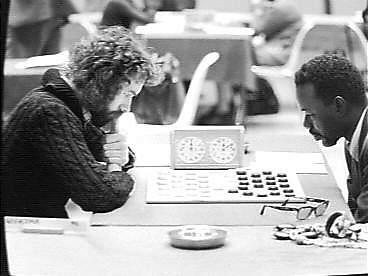 After the well-publicised but never played match on the world title between Wiersma and Kuperman in 1980, Sijbrands has written that the history of the draughts game is replete with matches never materialised, a statement all the more relevant for Baba Sy, as well as for the draughts history after his death. 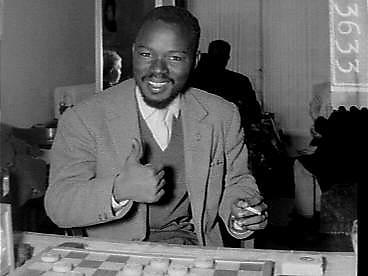 What Woldouby could not accomplish with his dazzling performance in Paris in 1910, Baba Sy did accomplish: he opened our short-sighted eyes for the hitherto undreamed draughts talents on the continent of Africa. 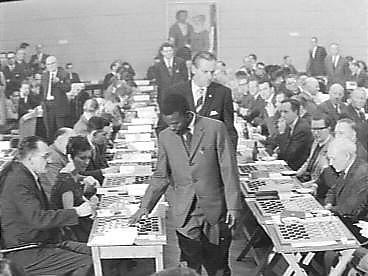 A quick opening of the African draughts continent followed: the international tournament of Bamako (Mali) in 1980 (won by Ton Sijbrands), the creation of the African Draughts Confederation, the World Championship of 1980 in Bamako, the World Championship of 1984 in Dakar (Senegal) and recently the 1996 World Championship in Abidjan (Ivory Coast). 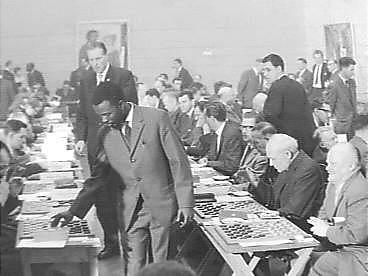 The General Assembly of the World Draughts Association in Dakar has discussed at length the unplayed match Kuperman - Baba Sy, with as eventual result the declaration by the 1986 General Assembly in Groningen (The Netherlands) to allot the title of World Champion posthumously to the legendary Senegalese player, thus closing the book on Baba Sy. 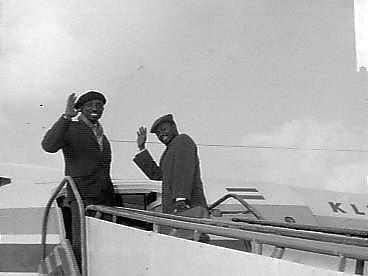 Baba Sy, with his above-mentioned sportivity and gentleness had lots of friends in Europe. In tournaments and simultaneous games, he had made many friends, who will forever remember him. 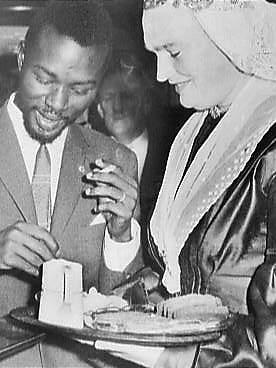 From the time of his first performance in the Netherlands, my wife and I started a lasting friendship with him, and were constantly surprised by his rapid adaptation to new circumstances. 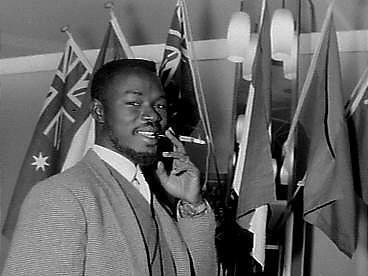 Some facts: on 27 January 1962 Baba Sy put the world record simultaneous games at 150. 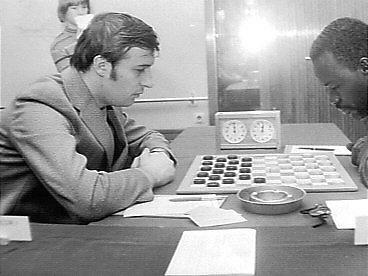 In the Pulchri studio in The Hague Baba Sy won 112 games, lost 5 with the rest as a draw: an impressive percentage of 85.6 %." How did you find this picture Jacques? I was searching for it a long time. 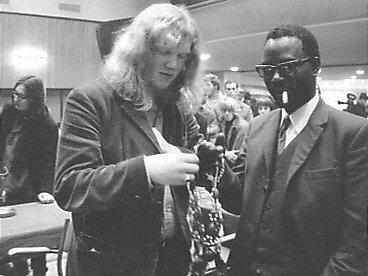 It was next to an interview with Jean-Marc in the Amsterdam Newspaper Het Parool in december 2003, but Het Parool didn't publish the picture on their website. I'm glad you found it! chessdrummer wrote: Thanks for the correction. I've made the changes on the six pages where his name appears. I didn't see Ndiaga for a long time. Mostly he is travelling. He will be in Cannes, France from February 20th. 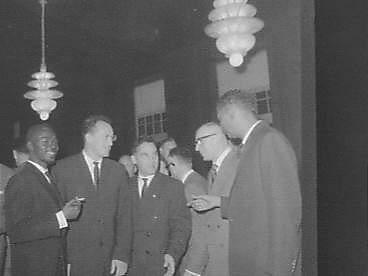 His residence is Amsterdam. He will be amused when I tell him about your site! You need some pictures from Ndiaga? chessdrummer wrote: I'm really intrigued at the world you all are in! 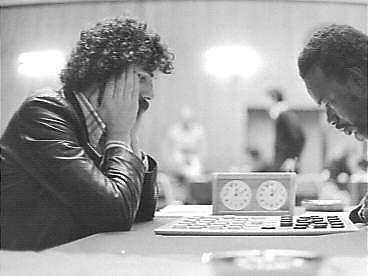 Is Ton Sijbands the draught equivalient to our Garry Kasparov? 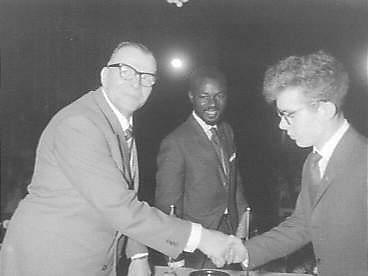 Ton Sijbrands was our world champion in the days of Bobby Fischer, with whom -as a player- he was often compared. 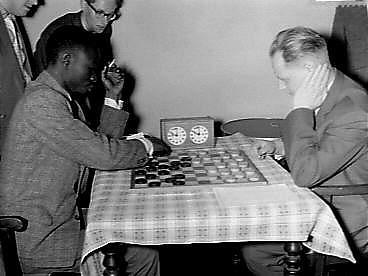 chessdrummer wrote: West Africa is strong is draughts, but very weak in chess. I believe the two phenomena are related. 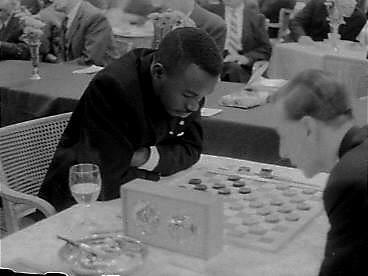 In West Africa, only Nigeria is strong in chess. I think you guys have a monopoly on board sports in that region. We try to keep it this way. 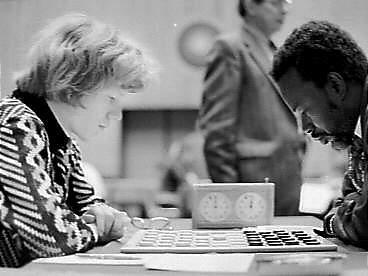 chessdrummer wrote: How many draught players compete in chess? 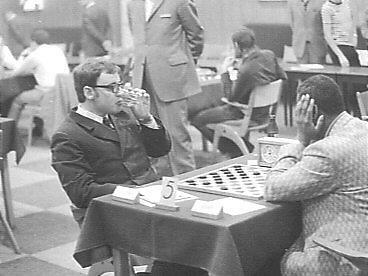 We have chess players who play competitive shogi and poker, but who are some noted draught players who play chess? There are some who play both. 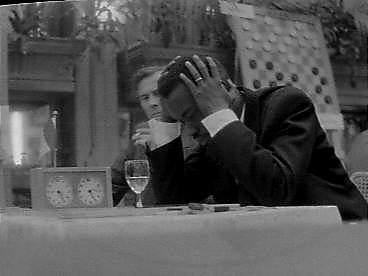 Ton Sijbrands happens to be one of them, but according to the stories he's a poor chess player. 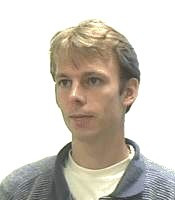 The best-known draughtsplayer who also plays chess is Erik Hoeksema, but I think you never heard his name. 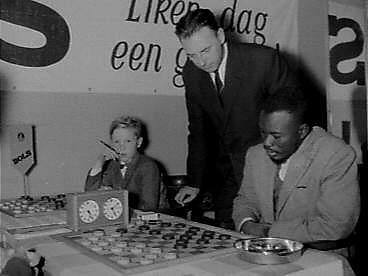 He will try to improve he world record simultaneous play draughts and chess in coming April during the next Dutch championships in Groningen. The website unfortunately is only in Dutch, http://www.nkdammen2005.nl/ but maybe you can understand a little if you click on Nevenactiviteiten and then on Wereldrecord Simultaan .